The democratic Weimar Republic fell with dizzying speed. This history still stuns. In Germany, one of the most well educated and sophisticated societies in the world, the democratic Weimar Republic fell with dizzying speed. The overthrow was engineered by authoritarian conservatives and Adolf Hitler, a former German army private and fringe political agitator with little formal education or resources. He spoke out against minorities, immigrants, free trade, a free press, free speech, the rule of law, and for a restoring German nationalism and its military power after the Allied victory in the First World War. In short order Hitler replaced the free Weimar society with a barbaric, absolute Nazi dictatorship that stunned the world, especially the major democracies. Germans could not have imagined in 1933, when Hitler became chancellor, that his government would lead the ill-fated nation to commit mass atrocities and genocide, and to spark the greatest war ever resulting in the slaughter of tens of millions of soldiers and civilians alike. As the future of modern democracies seems uncertain today, acclaimed historian Professor Benjamin Carter Hett has written a cautionary history of this fraught period. 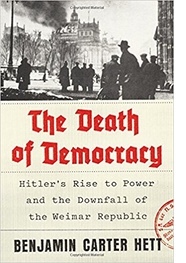 He details Hitler’s improbable takeover of the German government in his lively and extensively researched new book, The Death of Democracy: Hitler’s Rise to Power and the Downfall of the Weimar Republic (Henry Holt). Without mentioning any current politicians, Professor Hett invites readers to draw their own conclusions about politics now from the lessons of history. As the book describes, the Weimar democracy was stable and functioning in the 1920s and it guaranteed individual rights and liberties, workers’ rights, and tolerance for immigrants and others. But this enlightened democracy embittered and united its opponents—particularly right-wing political leaders, business interests, nationalists, and the military. Professor Hett describes how many conservatives saw Hitler a vulgar and frenzied nativist, but—because of his appeal to a growing populist movement in rural, Protestant Germany—they planned to use him to seize power and then depose him. But, by 1932, the conservative bloc had no choice but to bring an increasingly popular Hitler into government. He was sworn in as chancellor in January 1933. The suspicious fire the destroyed the German Parliament, the Reichstag, just four weeks later cemented Hitler’s position and an enabling act from Parliament soon ended all vestiges of democracy and paved the way for an absolute Nazi dictatorship. Professor Hett’s book draws on his original research and offers news insights on the complicity of conservatives with Hitler that led to the Nazi overthrow of the democracy and Hitler’s assumption of dictatorial powers. The book reveals how fragile democracy can be and how the rise of Hitler would not have been possible without the complicity of traditional political leaders bent on forming their own autocracy. Professor Hett aptly dedicates his book “To everyone who fights for freedom, human rights, democracy, peace, and tolerance.”The Death of Democracy deserves a wide readership as the fates of many democratic societies hang in the balance today. 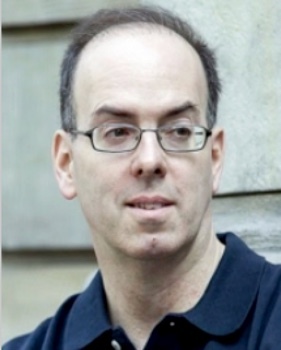 Professor Hett has taught history at Hunter College and the Graduate Center of the City University of New York since 2003. He earned a J.D. from the University of Toronto (1990). Four years of legal practice convinced him to return to the University of Toronto for an MA in History (1995) before he moved on to Harvard for a Ph.D. (2001). His other books include Death in the Tiergarten; Crossing Hitler—Winner of the Ernst Fraenkel Prize; and Burning the Reichstag. 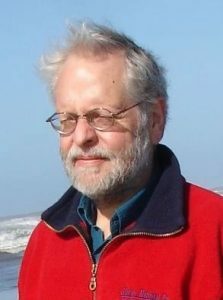 He is the recipient numerous honors for his work such as the 2014 Hunter College Presidential Award for Excellence in Scholarship and Creative Activity; the Hans Rosenberg Prize for the best article on German history by a North American scholar; and fellowships from the Guggenheim Foundation and the American Council of Learned Societies. Professor Hett generously discussed his work, his new book, The Death of Democracy, and the lessons of history for today, by telephone from his office in New York. Robin Lindley: I admire your work on the history of Germany, Professor Hett. I saw that you grew up in Edmonton, Alberta, Canada, and that you studied law and worked as a lawyer for several years before earning your doctorate in history. How did you become a lawyer and then decide to make a career change to history? Professor Benjamin Carter Hett: When I was in college, I think I was like a lot of people in college in that I didn’t know what to do after college. I did a political science degree in college, not history. The reason for that was I went to college where my dad was a professor in the history department and he told me in no uncertain terms that it would be awkward for him if I were a history major. So, I did what I thought was the next closest thing. I think many people in political science end up in law school. When I got to my senior year, it seemed to me that all of the people I liked were going to law school so I thought I guess I’ll do that too. So, I did. It was really no better reason than that. I went to a very good school, the University of Toronto Law School. I got a job coming out of it at basically the Canadian equivalent of a Wall Street firm—at a Bay Street firm in Toronto, which means a large corporate law firm in downtown Toronto. I worked there for four years. I was doing corporate litigation, which bored me to tears because I basically didn’t care about what happened to the clients. I did some criminal practice on my own, out the back door, because it did interest me, and that’s what I always thought I would do. I got the advice in law school that you should get a job a prestigious firm because you can turn on that experience to get another job. It seemed that advice didn’t actually work out. So I hated the job and that was the long and the short of it, and I had always been interested in history. My parents in different ways are both historians and I grew up with that. And I was reading history in the spare time I had as a lawyer. I actually had a moment of revelation. My wife calls in my “epiphany.” On one beautiful, sunny Sunday afternoon when I was walking to my office, I stopped at a bookstore and bought a couple of books about World War I. I remember leaving the bookstore and going out onto the street and looking at the books and thinking, “I would so much rather go home and read these than go back than go to the office and do what I had to do there.” It hit me that, “Ben, what you should do is quit your job and go back to school and get a Ph.D. and become a history professor.” And that’s basically what I did. That’s how I ended up a history professor. Robin Lindley: How did you come to specialize in German history? Did you have family or other connections to Germany? Professor Benjamin Carter Hett: No, not really. My dad is partly of German heritage. My dad grew up in a town now called Kitchener, Ontario, but until World War I, it was called Berlin, Ontario. It’s in a region where there were a lot of German immigrants to Canada. My dad’s heritage is roughly half German and half British. My mom is from New York City and she is Irish-American. My background didn’t have a lot of German and, by the time it got to me, it was pretty watered down. My grandfather was underage when he volunteered for the Canadian forces in the First World War, so there wasn’t much German even by that time. German history was actually an accident. When I went back to school to study history, initially I did a master’s degree at the University of Toronto and I was going to specialize in British history. I was looking to fill up my course program, and I didn’t want to get up too early, so I was looking for something in the afternoon or evening. I found this seminar on Imperial Germany that with a fabulous professor there, Jim Retallack, I thought that might be interesting, and I signed up for that. What I noticed then about German history is that everything went wrong, whereas in British history everything went pretty well, at least until the 1950s. It occurred to me that things going wrong is more interesting than things going well. I was fascinated by the sequence of disasters in modern German history. Then of course I figured that I’d have to learn the language if I want to study this history. Robin Lindley: What was the topic of your dissertation? Professor Benjamin Carter Hett: It drew on my legal background, and it was on criminal trials in Berlin before the First World War. I was interested in how the courts worked. 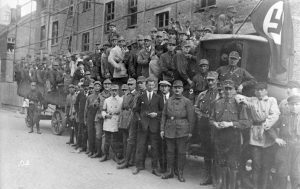 The historical literature at the time tended to say that the German legal system then had been very much a part of the general authoritarian state and the legal system had been about crushing workers and crushing dissidents in various forms. I made the argument that it was more complicated than that—that there was actually a palpable liberalization under way in the criminal justice system that you could see in the in the 25 years before World War I. My dissertation was published as a book in 2004 called Death in the Tiergarten. It traces cases that went on in Berlin’s criminal courtrooms from about 1891 to 1914 to illustrate this trend toward liberalization. Robin Lindley: That sounds like a very ambitious book. Professor Benjamin Carter Hett: It involved me not only learning to read an intellectually difficult language but it also gave me some familiarity with a different legal system. You’ll appreciate this as a lawyer. What hit me was that the hard thing to get was the many unarticulated assumptions because the legal system is a closed world where everyone understands the rules of the game so you don’t have to articulate them. And the rules of the game in the German legal system, especially procedurally, are so different from what we see in a common law tradition. For example, there’s basically no law of evidence in Germany. It’s a judge-based system, not a jury system like the Anglo-American system, so they don’t have an elaborate structure rules of evidence to keep evidence away from the supposedly stupid jurors who won’t be able to make sense of it. The idea is you can trust the trained judges to make sense of the evidence so you don’t have rules of evidence. I spent a lot of time trying to figure out this concept because, in trial transcripts, half the evidence would be hearsay because they have no rules of evidence. I had to figure all this out. I never had a course in German law. It was difficult but a fun challenge. Robin Lindley: And then you became an expert on Weimar and Nazi Germany with your books that followed, including your investigation of the 1933 Reichstag fire. Professor Benjamin Carter Hett: Yes. As an outgrowth of my dissertation, I got interested in German law. 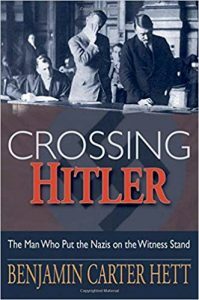 I wrote a second book (Crossing Hitler) about an amazing man, Hans Litten, who was a trial lawyer in the Weimar Republic who had the courage to subpoena Hitler as a witness and cross-examine him mercilessly in a 1931 trial, for which Litten paid a terrible price after in the concentration camps. I thought that was an incredible story, and that got me into the questions about the end of the Weimar Republic and what happened, in part because Hans Litten was arrested by the Nazis on the night of the Reichstag fire. From that, I got interested in the Reichstag fire and wrote my third book on that. After these two books on the end of Weimar, the idea was suggested to me—after the 2016 election—that I might write a book about the end of Weimar for a general audience. I wasn’t trying to make overt parallels but perhaps letting the parallels emerge between the lines so that was the premise for The Death of Democracy. Robin Lindley: Was your new book a direct response to the election and rise of Trump and of nationalism in Europe? Professor Benjamin Carter Hett: Yes. That would be fair to say. I intended a cautionary tale. But I want to be careful about that. I am by no means saying that Trump is Hitler. There are a million ways in which Trump is a very different human being than Hitler. He certainly is not possessed of the kind of absolutely malevolent force of evil that Hitler was. Nor does Trump have anything like the political skills that Hitler had. But I do think there are some underlying political structures now in the United States and in some of the European countries that raise disturbing parallels. In many ways, our world now generally resembles the world of the twenties and thirties. There’s a repetition where, at the end of the Cold War, there was a triumph of democracy, much like there was a triumph of democracy at the end of World War I with new regimes created and the sweep of democracy across Europe. But these regimes collapsed into totalitarian regimes. Much of that is happening again. Since the euphoria of 1989 to 1991, some of the new democratic regimes haven’t worked out that well. Some have collapsed into authoritarianism, notably Hungary and Russia. And even in citadels of old democracy—France, Britain, and Germany—we see very undemocratic sorts of politics. Undemocratic politics is reminiscent of the twenties and thirties anti-globalist, populist politics directed at economic forces which are international and unreachable and devastating to many people. Of course, that’s what’s happening in the United States and what fueled Trump’s sentiments on the part of people who have been hurt by economic trends. That is a lot like Europe and specifically Germany in the twenties and thirties. We know where that story went. I’m not necessarily saying history will repeat itself to the extent that we’ll have brutal, mass-murdering, genocidal dictatorships taking the place of democracies. But I do think that the basic impetus behind these politics cannot lead to anything good. It cannot lead to freedom. It cannot lead to tolerance. It cannot lead to good conditions for migrants. It also cannot lead to prosperity because the Depression taught that protectionism doesn’t work as a remedy for global economic troubles. So, there’s a lot that we shouldn’t be repeating that I would have thought we wouldn’t repeat but it seems we are repeating. Robin Lindley: You vividly chronicle the events that led to the rise of Nazism in Germany. In the twenties, Germany probably had one of the most sophisticated and well-educated populations in the world. The Weimar Republic then was a stable democracy. As you describe, the rapid collapse of democracy and rise of the Third Reich was stunning. How did that happen so quickly? Professor Benjamin Carter Hett:This is one of the most complex questions in history. As I say in the book, many, many people, far, far smarter and more learned than I have looked at this issue over decades and there are a wide, wide range of answers to this question. With all due humility, I have my answer, and it goes like this. There was a complex of things at work. On one hand, there was a populist, grassroots movement that engaged against manifestations of what we’d call globalism that were hitting Germany, including trade, financial and treaty arrangements, and migration flows. All of these were causing anger. Hitler and the Nazis, it turns out, were best able to capitalize on that anger and make themselves advocates of the people who were angry about what the world was doing to Germany. The second thing was a pattern of frustration with the Weimar democracy that came from two places: the military high command and big business because the democratic system was not working for them in different ways. It wasn’t allowing soldiers to grow the armed forces. For business, the Weimar state brought more regulations including a state wage arbitration system that was costing companies too much money in wages. Corporations thought unions were too powerful. Workers had representation by law under the constitution in workplaces. The welfare state was expensive. And business wanted to scale that back. They knew that the only way to scale that back is to find a way to keep the Social Democratic Party from having too much power. The Social Democratic Party was the biggest party Germany and the most electorally successful. And they were the backers of democracy and the Weimar social state. To limit the power of the Social Democrats, the military and business needed to limit democracy as a whole because they understood that their agenda would never attract much popular support in elections. And it happened, this desire encountered this populist, anti-globalist movement, particularly with the Nazis. So these elite, powerful men think, Aha, this is something we can use. This is a movement with its impetus in the right wing. We can make this work for us, if we can make the leader of the movement work for us. They look on this leader, Adolf Hitler, and notoriously underestimate him. They see him as a vulgar man of humble background who never rose above the rank of private in the war—who could be easily manipulated. There was this complicated dance for about two years where a small circle of powerful men around the president of German Republic, Field Marshal von Hindenburg, tried to find a way to get the Nazis enlisted behind them. And, of course, Hitler had his own agenda, which involved him holding power and not being the tool of others. Finally, the elite men decide they’re out of options and the Communist Party rises and gets more threatening. They decide is to make a deal with Hitler on his terms although they still think they can run him. 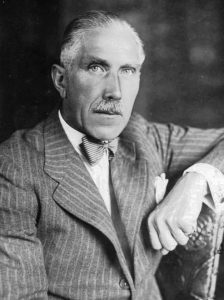 The man who was chancellor in 1932, Franz von Papen, made a deal with Hitler and with Reich President Paul von Hindenburg to create an administration with Hitler as chancellor and von Papen as vice chancellor, and Papen and people of his stripe are confident they can manipulate Hitler and run his government. Of course, we know how that ends. Hitler proved to be much more cunning, much more ruthless, than they had dreamed, and he very quickly escaped from their control and created the dictatorship. But that never would have happened had these few powerful elite men not opened the door to Hitler. It did not have to happen. Robin Lindley: Do you see a parallel now with how German conservatives used Hitler and with how the Republicans today, including “Never Trumps,” are all now embracing Trump as the Republican Party has become the party of Trump. Professor Benjamin Carter Hett: Yes. In a way my book is addressed to people who will probably never read it. I would like to have the attention of Mitch McConnell and Lindsay Graham and Jeff Flake. People like that. They’re the ones who need to ponder this, to think about the Faustian bargain they’re making with Trump. I think in exactly the same way, they went into it thinking that Trump and his movement were something they could control and would work for them. And what we are seeing now is that Trump has taken over the Republican Party and there are no moderate Republicans left. Much the same as the military and big business in the thirties in Germany, [Republicans] are getting a lot of what they want, like the tax cuts for instance. As long as they keep getting what they want, I think they may not see the light, unfortunately. That was certainly the case in Germany. The army got what it wanted in terms of an arms buildup and they only started rethinking this in 1938 as Hitler was steering them towards a war they thought they would lose, and then even more when they started losing the Second World War. And big business only started rethinking this around the time their factories were being obliterated by Allied bombs. I wouldn’t be too optimistic that there will be much recognition of what’s happening to the Republican establishment, but that is one of the parallels with Germany with the right side of our political structure rallying around Trump. There’s another parallel dynamic. There is a book I read a couple of years ago by Jacob Hacker and Paul Pierson called Winner Take All Politics. They argue that starting in about the early seventies, American big business decided it was losing particularly because of the Great Society reforms of the Johnson Administration and some regulatory reforms of the Nixon Administration. Business decided to push back so they got more active in politics and moved into the Republican Party and made the party their instrument. The result of 40 years of their policies have had the effect of creating no real increase in the salaries or wages of the great majority of the American people. And, according to the authors, all of the economic growth has been happened in the past 40 years has gone not to the top one percent but only to the top .1 percent. That is similar to the dynamic that happened to Germany in the late twenties. That’s the same reaction when elites were not gaining from democracy and needed to find a way to turn back the tide. In Germany it happened much faster and more catastrophically. The German version took about five years, it has taken about 40 years in America and has not gone as far. The basic dynamic, however, is about the same, and that’s one of the things I find disturbing about our moment now. Robin Lindley: Those parallels are chilling. How did Hitler become so effective in appealing to German people? His background was humble with a limited education and an undistinguished military record. He had a gift for public speaking and for lying and for inciting angry people. How was Hitler seen by people in the late twenties and early thirties? 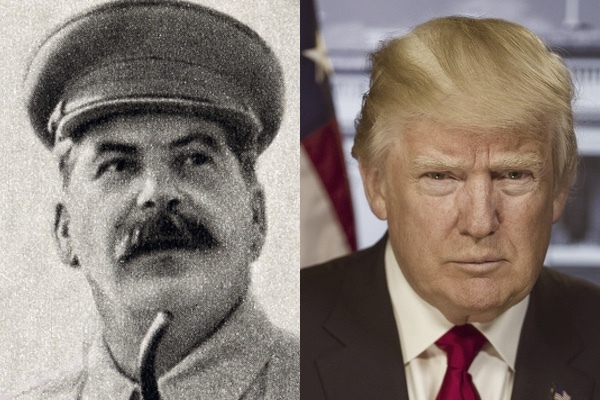 Professor Benjamin Carter Hett: It’s true that Hitler entered the political game seemingly with nothing going for him, which is a difference from Trump because Trump, of course, was born with a proverbial silver spoon in his mouth, which Hitler wasn’t. Hitler emerged from the First World War an utterly nameless person with no resources, very little formal education, no money, no family position or connections. But it turned out that there’s one thing Hitler was good at, and that was speaking. Oddly enough, it was the army that allowed this gift to unfold. Hitler desperately wanted to stay in the army at the end of World War I because it was the closest thing he had to a home. The army gave him a job involving the political education of soldiers. He would lecture soldiers and he and his officers discovered that he had a speaking ability. Then, Hitler spoke at a meeting of the DAP—the German Workers Party—and impressed them so they started using him as a speaker. 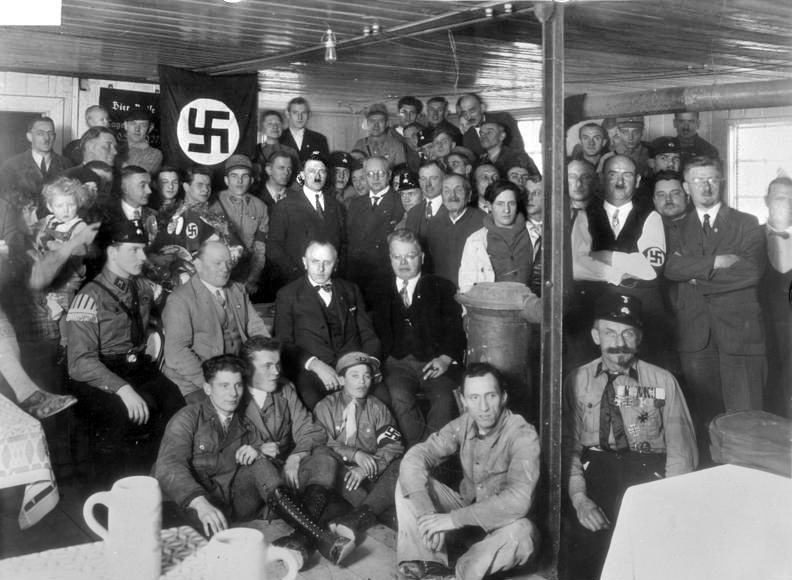 Eventually, in the 1920s, he reformulated the party and became its leader, and he changed the name to the National Socialist German Workers Party. He became the party’s most effective public speaker at political rallies around Munich and built a following this way. So, Hitler had two or three remarkable talents and I think we have to recognize this. It does no good to simply demonize Hitler. He had an amazing ability to captivate a crowd. That was based on a second strength he had. He had remarkable intuition for what people were thinking and feeling and wanted to hear. This was odd, because he was very cut off from other people. He wasn’t very close to anybody, and yet he had this remarkable intuition both for crowds and, if talking with somebody one on one, he also a real ability to figure out what a person was thinking and to then to say what that person would want to hear. And he did this over and over again. A third strength he had is somewhat related. He had this amazing political cunning and this ability to size up opponents and to guess their weaknesses and exploit those. He had remarkable nerve. He had the nerve to be patient and wait for the right moment when other people would have made some move earlier that wouldn’t have been as advantageous. He had the nerve to wait for the moment to act, and act quickly when those moments came. Basically, those qualities allowed him to rise from this nameless private coming out of World War I to, by the middle of 1933, being the dictator of one of the world’s potentially strongest countries. It was a remarkable life. It would be an inspiring story if it had been a man like Martin Luther King coming from nowhere and doing remarkable things. Hitler got where he got because of certain remarkable talents. Robin Lindley: And we think of Hitler describing the Germans as the Ubermensch or Super Men, and superior to other people. It may surprise some readers, but you point out that Hitler had great contempt for the German people. Professor Benjamin Carter Hett: Yes. It seems counterintuitive because the thing that everyone knows about Hitler is this idea that he believed in the idea of the Germans as the Master Race. But if you read Mein Kampf and some of his private comments to the people around him, you see a great deal of contempt for the great majority of Germans, and the great majority of everyone else too. This was also an ingredient of his political thinking. There’s a passage in Mein Kampf where he talks about the use of lies in politics. His basic idea was that people are too stupid to figure out a complex political message, so you have to tell a story that will connect with them on a gut level. It has to be simple, emotional, and it doesn’t have to be true. If you tell a really big lie that is useful for you and has emotional relevance to people, that will work well politically because people won’t be able to sort it out. Particularly, he thought, the bigger the lies the better because people will be less skeptical of a big lie than a small lie. And even if someone comes along and debunks it, a residue of the lie will stick. When I read that, I thought of John Kerry and the Swift Boats, a lie that got debunked and yet it stuck, and there are many examples. On one level this is a rather shrewd political insight, but under it is Hitler’s contempt for ordinary people. He actually goes on and on about this point in Mein Kampf. He talks about this in gendered terms. He talks about the crowds as feminine and they need to be dominated by a great speaker who is a leader. In his way of thinking, this adds up to thinking that crowds of people aren’t intelligent, but they’re emotional. They can’t think critically. You need to reach them on an emotional level. He always said that the masses of people aren’t up to much political understanding. Don’t waste time explaining the details of policy. And behind all of this is Hitler’s contempt for people. Historian Timothy Snyder said that Hitler was not so much a nationalist as he was a zoological anarchist. He applied this with a quite consistent logic. At the end of World War II when his side is obviously losing, Hitler said several times that the Russians had proved to be the stronger people because they were beating Germany and that’s the way it should go in the world. And the German people should be exterminated by the stronger people if that is right. He was willing to take the consequences in a sense under this zoological anarchism he identified with. Robin Lindley: What sorts of people were attracted to Hitler’s message as he rose to power? Professor Benjamin Carter Hett: We have clear information on this. We can look at what starts to happen in state elections in the late 1920s and then in national elections in the early 1930s. The Nazis started to do well electorally in rural, Protestant areas of Germany, basically in the north and the east. The rural areas were getting badly hurt by the condition of the international grain market then when grain prices had fallen a lot. So long as Germany had no tariffs against grain imports, you could bring in grain from the United States or Canada or Argentina much more cheaply than you could grow it there. Farms were going bankrupt or not making money, and there was a lot of anger about this in the country. You can see why rural people would appreciate the Nazi message about global economic problems. Protestants more than Catholics were attracted to Nazis. Catholics were integrated into their own political parties. There was the Catholic Center Party for most of Germany and there was also a Bavarian version called the Bavarian People’s Party. Bavaria is kind of the Texas of Germany, so it had to have its own party. Catholics were impervious to the Nazi appeal mainly for reasons of cultural unfamiliarity. The urban working classes were integrated into either the Social Democratic Party or the Communist Party. The Nazis didn’t make too many inroads into that group. They did some in 1932 and 1933, but not a lot. Where they really picked up votes was with Protestants in rural areas and, after 1930, also with Protestants in urban areas. It was a Protestant, middle-class, and rural peasant constituency to whom the Nazi message appealed. Part of that was cultural and there’s an interesting parallel to the United States now. 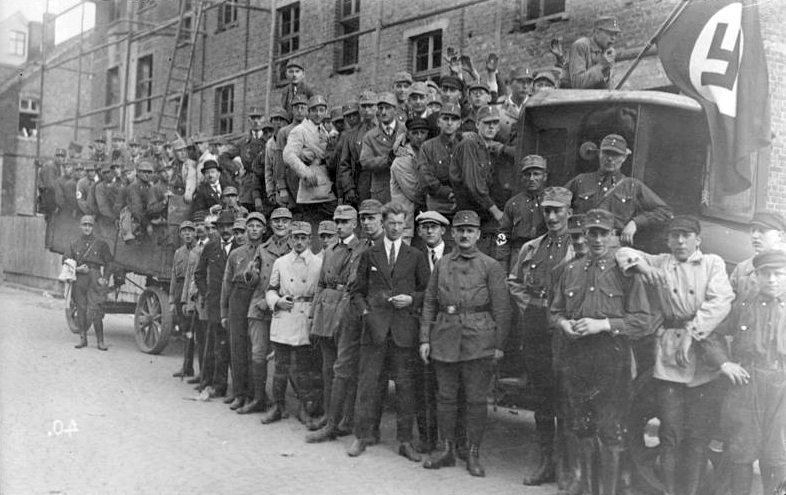 There was a lot of feeling among some of the rural Protestants that the Weimar Republic was alien, especially in Berlin, a very cosmopolitan city where you had all kinds of modern art and sexual experimentation. All of that looked bad to these Protestant, rural people. There was a strong tendency on their part to think that the Weimar Republic was too Jewish, too foreign, too Catholic. Whatever a Protestant didn’t like, the Weimar Republic had too much of. So, a lot of the hatred of Weimar had to do with culture—the culture of modernity, the diversity, the sexual experimentation, feminism, and “foreign” democratic and liberal ideas. Robin Lindley: Hitler became chancellor in January 1933. You’re an expert on the Reichstag fire, the burning of the German Parliament, just weeks later. That helped cement Hitler’s position in the government. What events do you see in his early chancellorship that strengthened his political hold on Germany? Professor Benjamin Carter Hett: There are several events that stick out. One was the Reichstag fire, which occurred on February 27, 1933, exactly four weeks after Hitler became chancellor. The fire within the German Parliament is controversial to this day, and there’s still not universal agreement on who set the fire. But there is universal agreement on the consequences of the fire. Hitler used the fire to get Reich President von Hindenburg to agree to announce a draconian emergency decree which tore out individual rights and protections of the Weimar constitution. It ended freedom of speech, freedom of the press, freedom of assembly, confidentiality of mail and telegraph systems. And importantly, and not often mentioned, it allowed the Nazis to take over the state governments because the decree gave the central Reich government the authority to take over the government of the federal states, if necessary. And they did take over. The federal states were possible areas of opposition, and the decree took that down. Six days after the Reichstag fire, there was an election. The fire occurred in the course of an election campaign. In that election, the Nazis did better than they ever had before, but to their surprise, they didn’t win the majority of seats in a not particularly free election. They won 43 percent of the vote. Their coalition partners won eight percent, so they had 51 percent. But they needed two-thirds to put an enabling act through the Reichstag that would turn all of the Reichstag’s power over to Hitler’s administration. That would be a constitutional amendment and Hitler would need a two-thirds vote for that. Nazis went into the Reichstag after the election not having two-thirds. The question was whether any of the center-left parties would back him. The shameful part of this story is that almost all of the center and liberal parties did back him. Most importantly, the one big party in that group, the Catholic Center Party, voted in favor of the Enabling Act. The brave part of the story is that the Social Democrats, the left of center party, to a person—with a little over 90 deputies who were able to be at the Kroll Opera House for the vote (in the Opera because the Reichstag was damaged) and every one of them voted against the act. A very brave thing to do. There Nazis all around the hall bashed their fists into their hands, saying things like “Marxist sow, we’re going to string you up.” I don’t think they get enough credit for the vote against the Enabling Act. Nevertheless, the law passed and Hitler had pretty much unlimited power because he had the power to legislate. It also meant that he came out from under the control of Reich President Hindenburg. He didn’t need to go to Hindenburg for executive orders because Hitler had the power to legislate that the Reichstag had had. At this point, by March 23, 1933, Hitler had not even been in two months yet as chancellor, and he was effectively the dictator. And the process of consolidating power moves very quickly after March 23. They quickly break up all of the trade union. By spring and summer, they outlaw all of the other political parties. By July, Hitler decreed that the only legal party is the Nazi party. With that law in July, he was a dictator and there was no meaningful opposition left, unless it came from the army. But that’s a narrative that runs through famous Valkyrie plot of July 1944. It was always the army that Hitler had to worry about but, as long as the army was getting what it wanted, the officers stayed calm. If the officers thought Hitler was steering them to disaster, they would get restive. Basically, by July 1933, Hitler effectively became a dictator. Robin Lindley: You actually conducted your own in-depth investigation of the Reichstag fire that you detailed in your groundbreaking book on the fire. You had access to documents that only became available in the nineties and later. Do you think that Nazis either set that fire or encouraged the arson in the Reichstag? 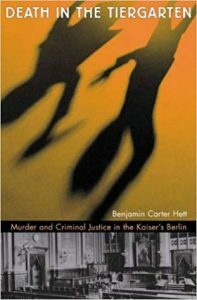 Professor Benjamin Carter Hett: The argument over the Reichstag fire over the last 50 or 60 years has been like that over the Kennedy assassination. The question is: did the one man arrested at the scene of the crime, Marinus van der Lubbe, a slightly crazy, mostly blind, 24-year-old Dutch journeyman stonemason, do it himself? Or was he a stooge in someone else’s conspiracy? Those are the two positions in the debate. And, if he was a stooge in someone else’s conspiracy, he was certainly a stooge in a Nazi conspiracy. Among historians, the orthodoxy since about the middle of the 1960s has been that van der Lubbe acted alone, and that the Nazis didn’t know the fire was going to happen but used the fire as a welcome pretext for their decree. My argument is based largely on evidence that became available after the end of the Cold War, and based to some extent on scientific studies of how a fire spreads in a building like the Reichstag. I think the evidence permits two conclusions. One, it was impossible for one man, in the time and with the equipment van der Lubbe had, to set the fire that destroyed the Reichstag’s plenary chamber that evening. That’s a conclusion you can take to the bank. There’s no way he could have set that fire himself. And two, based mostly on newly discovered documents, there’s a good circumstantial case that the fire was actually set by a squad of Nazi stormtroopers led by a man named Hans-Georg Gewehr who was known in Berlin in the thirties as the Nazi brownshirt expert on incendiaries. He actually coached officers on how to set fires. There is extensive evidence that points to him as the leader of this effort. I think that’s what happened. I don’t think the evidence reaches beyond a reasonable doubt, but knowing about Gewehr and the character of the fire and the structure, I think it’s the most plausible possibility. I think it is beyond a reasonable doubt that van der Lubbe didn’t do it alone. That’s basically the conclusion of my book. There’s a third part: the politics of how the fire has been written about since World War II. It’s interesting that those Germans who argued after the war that van der Lubbe acted alone were mostly Nazi police officers who investigated the fire at the time, or they were spokesmen for these officers. And these officers had a lot to cover up. They were war criminals in the Nazi era. The fire was a rhetorical event where they could display their speaking truth to power. That worked for them very well by claiming van der Lubbe acted alone. I think most of them knew that the Nazis set the fire. There were war crimes trials and de-Nazification trials and, for propaganda reasons, it was better for them to say in the forties and fifties that the arsonist acted alone. There was this amazing intelligence officer, Fritz Tobias, who became their spokesman and wrote a huge, eight-hundred-page book on the fire concluding that van der Lubbe acted alone. My research unmasked Tobias as the same sort of falsifier of the historical record as somebody like the infamous British Holocaust denier, David Irving. Robin Lindley: Your research was extensive. Hitler blamed the fire on a Communist conspiracy. Professor Benjamin Carter Hett: Yes. That’s one we can clearly write off. It was either van der Lubbe alone or a Nazi conspiracy. If you have to take one of those theories, it was clearly a Nazi conspiracy. 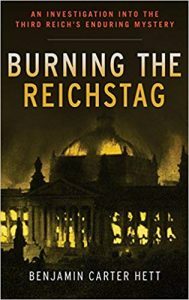 Robin Lindley: Didn’t Alan Bullock in his book on Hitler indicate that the Reichstag fire was set by Nazis? Professor Benjamin Carter Hett: He did in the first edition of his biography of Hitler, but he was persuaded by Fritz Tobias in the sixties so Bullock changed his view in the later editions of the biography of Hitler. Typically, historians took that view. Sir Ian Kershaw in his definitive biography of Hitler in the nineties took that view. But I should say, in some correspondence and conversations I’ve had with Ian Kershaw, he has said that he finds my view persuasive. I found that very encouraging. Robin Lindley: Some people probably remember old newsreels of Nazis burning books. Our current president calls the press the “enemy of the people.” What were some of the things Nazis did in terms of dealing with the press and censorship? Professor Benjamin Carter Hett: The Nazis were very media savvy. That was an advantage they had over some political opponents. They understood how to use the new technology of that time. They understood how film and radio operated. They used phonograph records of Hitler’s speeches and used radio and film for propaganda even before 1932. Media was always a big concern for the Nazis. They moved quickly to make sure that they had its control in their own hands. Even before the Reichstag fire, they outlawed oppositional newspapers. They did this without any restriction after the fire. By mid-March 1933, the Nazi Party’s propaganda chief, Josef Goebbels, was named to head an agency they created, the Ministry of Popular Enlightenment and Propaganda. Goebbels job was to be the official minister of propaganda and he had under his control in his ministry all of the film, radio, most theater, and literature. So all of the forms of communicating ideas ended up in the hands of Goebbels who was a very clever, savvy advertising man. Robin Lindley: That’s another heartbreaking aspect of this story. You also look at the Nazis and the law as well. They hated democracy and the rule of law. Professor Benjamin Carter Hett:The rule of law will get in the way of any dictator. Dictators don’t like the rule of law. That was very much Hitler’s attitude. He had nothing but contempt for lawyers. He hated lawyers about as much as he hated anybody. The Nazis discovered as they went along that they didn’t want to promulgate their own laws. They wanted absolute power untrammeled by law. That ended up being how the Nazi state worked. There were stories about how a person might get acquitted by a regular court and then, as soon as the person got outside the courtroom, a couple of officers of the secret police would arrest and send the person to a concentration camp. Once the Gestapo sent you to a concentration camp, there wasn’t an appeal from that. Long ago the great jurist Ernst Fraenkel wrote that Nazi Germany was characterized by the prerogative state and the normative state. In the normative state, the structure of laws remained, but the prerogative state was superimposed over it and eventually that became the more powerful element at the disposal of Hitler and his henchmen so, basically, they could do what they wanted. Robin Lindley: You also write of some conservatives who wanted to get rid of Hitler after he seized power. You detail how this effort failed. How did that happen? Professor Benjamin Carter Hett: This is a very interesting story, even though a lot of professional historians don’t find it familiar. Almost everyone knows about the 1944 plot against Hitler. There have been movies on it like “Valkyrie.” What’s less well-known is how far back that went. Most historians know that the roots of “Valkyrie” were in events of 1938. But even before that, there was an earlier version as I describe in the book. Interestingly, there were a bunch of mostly young men who were very conservative who had opposed the Weimar democracy and worked for right-wing politicians or were right-wing politicians. Some of them went to work in 1933 in the office of the vice chancellor, Franz von Papen, who did so much to put Hitler into office. They immediately become an opposition force within the dictatorship. You might call them the adults in the room. They were very bright and very conservative but anti-Nazi for various reasons having to do with religion and traditions they thought the Nazis were contravening, or because they believed in the rule of law and objected to the Nazi brutality and arbitrariness. The attitude was summed up by the conservative intellectual Edgar Julius Jung who wrote a horrible book in 1927 about democracy with the title The Rule of Inferiors. That’s what he thought of democracy. And yet, as soon as Hitler was in, Jung wrote a letter to friend saying “we are partly responsible for Hitler being in power and we have to get rid of him.” Jung was a speechwriter for Papen and he became the intellectual center of these people working for Papen who started to think about how to get Hitler out. They started in 1933 and into 1934. The had a scenario for this. They would get Papen riled up to give an anti-Hitler speech on a prominent occasion and this would serve as an opening and they would go to President Hindenburg and say the Nazis are out of control. You need to use the army and arrest them. They did some of this. In June 1934, Papen actually gives a remarkable speech at the University of Marburg, which was cautiously framed but seriously critical of Hitler and the Nazi regime. This outburst of criticism from Hitler’s own vice chancellor was somewhat shocking. Everyone expected something would happen with a coup or a crackdown. For two weeks, there was a nervous suspended animation and then comes the “Night of the Long Knives,” which was a plot directed by Hitler get rid of some of his own people, the brownshirts, who were getting impatient with events not moving fast enough in the way they wanted it to go. But I argue that the real impetus for the “Night of the Long Knives” was precisely to strike out against the people around Papen. Hitler needed to eliminate them because they could conceivably have access to the real levers of power. It was possible that these right-wing people could get the army on their side against Hitler, particularly with Hindenburg. So, Hitler had to move. He had Papen arrested. He had two guys on Papen’s staff, including Edgar Julius Jung, killed. He had dozens of people killed and arrests made. He neutralized the threat from the right and also the threat from the brownshirts. But the brownshirts were less a threat to him than these people around Papen. After that action in 1934, it took four more years, in 1938, for some conservative Germans to again plot against Hitler because Hitler was threatening war which a lot of conservatives thought would be a disaster. And that marked the beginnings of what culminated in the 1944 Valkyrie plot. Many historians didn’t know of this story of Papen’s staff. A lot of legwork has been done by a talented young German historian named Rainer Orth who wrote a book on it. Unfortunately, his book is about a thousand pages long and in German, so it’s not something most Americans will read, so I wanted to introduce some of his work. It’s a new way of thinking about the history of the Reich. Robin Lindley: Your insights on the Papen group are new to me. Thanks for sharing your comments. I knew of the “Night of the Long Knives,” but only in terms of Hitler’s plan to murder SA or brownshirt leadership. Professor Benjamin Carter Hett: It was that too, but it probably would not have happened when it did had it not been for these events around von Papen. Right before the “Night of the Long Knives,” the leader of those stormtroopers sent his guys on leave so there was actually no threat coming from them at that moment. That points to the fact that the real point was to go after the people around Papen. Robin Lindley: The U.S. and Europe today are dealing with some of the same issues as Germany 85 years ago with the rise of nationalism, racism, and anti-immigrant sentiment. Critics of our administration today have described it as a kleptocracy or an oligarchy or a neofascist regime. How do you see Trump now and the Republican Party? Professor Benjamin Carter Hett: It does seem to have elements of a kleptocracy. Fascism is a difficult call. I find fascism a difficult and frustrating word because scores and scores of very smart historians and political scientists and political theorists have wrestled with what fascism means and have never really come to a clear, definitive answer. I’m going to stay agnostic on the question of whether Trump or whether the people behind him are fascist or not. I will say that Trump is at least a wannabe authoritarian. He clearly has no real understanding of what democratic leadership means. His instincts are highly authoritarian as manifested in the bromances he has with mass-murdering dictators around the world. He unfailingly loves foreign leaders who are brutal dictators, and doesn’t like democratic leaders. How could you like Putin and Duterte and not like Justin Trudeau. That is somebody who has an inverted and un-American set of values. Trump says things like protests are embarrassing and he wants to ban protests. I can’t imagine anything more profoundly authoritarian and un-American than that. When you look around and see that there are protests against your administration, Mr. President, that’s the thing that should make you proud of this country and not the other way around. That speaks to a profoundly authoritarian mindset that Trump has. I hope we can keep that in check. Robin Lindley: Democracy is fragile and it seems threatened in the U.S. now with Republican voter suppression efforts, a party marching in lockstep with an authoritarian president, and Russian attacks on our elections. What are ways that democracy can prevail in this environment? Professor Benjamin Carter Hett: The media is the key. We need media that will keep shining the light on what Trump does. It would be nice if the Republicans had some principles, but that’s probably utopian. Personally, I believe the Republicans are getting what they need for their own electorate, and if their electorate likes all of this, then we’re stuck with it. We need the other party, the Democrats, to campaign hard and intelligently on things which resonate with enough people to keep authoritarians out of power. I’m not sure what we can do anything other than that. And it may come to a time when some of us have to take some risks in speaking out against authoritarianism. Robin Lindley: It’s a time now when the Republican Party dominates every branch of government under a president who ignores the rule of law and separation of powers. Professor Benjamin Carter Hett: A lot of people are eager to see what happens in November. If the Democrats get control of the House, we will have some means of institutional check on what this administration and Republican majorities can do. Beyond that, I don’t know. If Republicans keep control of all branches of government, it will be interesting to see what happens after that. Robin Lindley: We’ve covered a lot of ground Professor Hett. Do you have any final thoughts for readers? Professor Benjamin Carter Hett: Go vote in November.